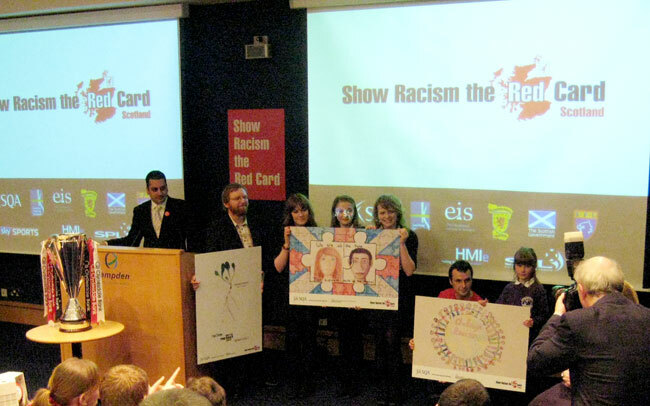 Congratulations to Year 1 HND student Ross Duncan, who scooped the first prize in the SQA-sponsored 'Show Racism the Red Card' competition. 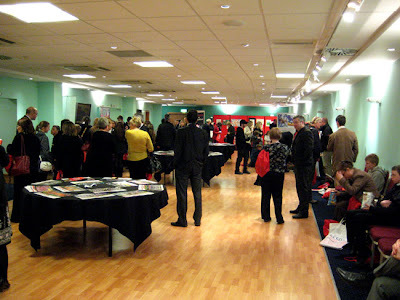 The Awards took place at Hampden Park, Scotland's National Football Stadium, and was attended by hundreds of entrants from primary, secondary and further education. Ross was shortlisted in the FE category for his 'Get to the Root Of It' poster, and on Thursday, myself and David Hiddleston accompanied Ross and his girlfriend Joanne on the trip through to Glasgow. The event was MC'd by STV Sports broadcaster Raman Bhardwaj, and the prizes were awarded by a host of footballing legends, including Mark Hateley, Gary Mackay and former Scotland coach Craig Brown. The judges included members of the SQA, and Evening News cartoonist Frank Boyle, who currently has his own exhibition on at Hampden. Ross received two tickets for the Scottish Cup Final, courtesy of Sky Sports. He'll spend the day as a VIP in the Media Centre during the big game, where he'll meet the commentators and get an insider look at broadcasting. Ross also received a shirt signed by his team, Hibernian FC, an iPod Touch, and a £200 cheque which goes to the Design, Media and Computing Department. The biggest prize however is going to be the exposure Ross' work gets - his poster will be used in Show Racism the Red Card's 2010 national campaign.